We go the extra mile to make sure your kitchen remodel is exactly the way you want it. Because we’re a locally owned company, we can ensure that your remodel job matches your taste, your space, and your budget. Whether you’re in the market for a small, efficient kitchen design or a large custom kitchen, we can accommodate your needs. We use only the highest quality materials in your kitchen remodel, so you can be assured that your investment is a smart one. Custom Kitchens to fit all of your needs! At Above and Beyond Home Improvement, we know the importance of getting exactly what you want, the first time. Our expert renovators will help you design a kitchen that has the perfect lighting, countertops, islands, and more, to make you feel at home. We will also help you find a variety of beautiful plumbing fixtures. If your countertops are getting a little dull, you can choose a new style from our many options. Gleaming countertops when you enter a kitchen make the whole room feel brighter and cleaner instantly! From a sophisticated granite, to a shining natural wood finish, you can choose an option that reflects your personality. A big kitchen can be glamorous and useful, but a small kitchen can be much more personal, and just as beautiful! To help you manage the small space you have to work with, we’ll show you our many small kitchen islands, less intense lighting options, and of course any other custom design thatwe can offer. 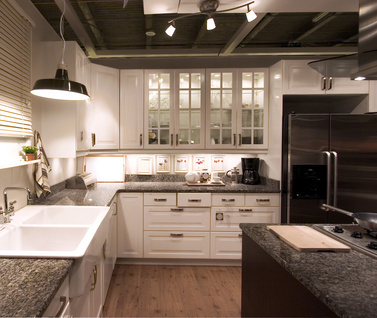 With the right layout, we can help you turn your small kitchen into a spacious and beautiful kitchen. Call us today for a kitchen remodel exactly the way you want it.